The hotel has been run by the Miles family for over 30 years. Over this time we have earned the respect of all local professionals concerned with the care of pets and we have consistently scored very high ratings in boarding licence inspections. The accommodation we provide is second to none. Due to the generous size of our apartments the central heating with individual radiators and the just like home ambiance we are particularly suitable for long term stays and boarding over the winter months. We spend a lot of time settling our guests in, getting to know them and attending to their dietary requirements. Please feel free to bring favourite toys, but not feeding dishes. We do require you to bring your cat's own bed or bedding, as these items really will help him to feel secure and comfortable. 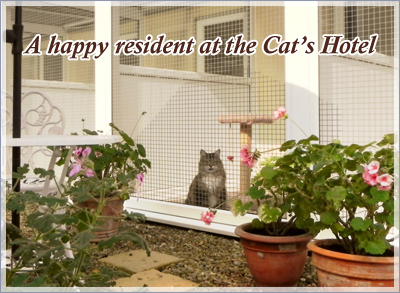 The Cattery is covered by an up-to-date security system and a member of the Family is in attendance at all times.